We are a group dedicated to the give / get philosophy of the Llama Trade! Within this group you'll find fellow deviants that have also caught the Llama craze. No matter what badge level you're at or where you're trying to achieve, here's the group that it's members are devoted to giving back the Llamas they get! I am going to leave the main page comment section open for llama begging trade advertising, but please limit yourself to once a day. Also, please give us the pleasure of your company before you advertise on our page! It can't get easier...join our group!! If you'd like to be featured during the month of your birthday, just drop the group a note and let me know when it is! Welcome to the current Lineup! A group of 11 Loyal Llama Traders will be featured for their outstanding devotion to always returning the llamas they get. Since their sent llama count is always higher than their received llama count, you can give one to each of the featured deviants and rest assured that you'll get a returned llama to increase your herd. Participation in the "LLL" is open to all Llama enthusiasts, not just members of this group. However, if you do choose to play our feature game and are not a member, be prepared to be invited to join! Also, I have been known to randomly grab a deviant (member or not) and put them in the feature. To have a chance at being featured on the next list, you must first make sure you've given a llama to all deviants on the current lineup. After that's done, post a comment on the current lineup that you'd like to be considered for the next lineup posting. Please make sure to check that your sent" Llama number is higher than your "received" to be eligible. This is Loyal Llama Trading after all! Each time the group passes another 100 member milestone, I'll add another space on the "LLL". 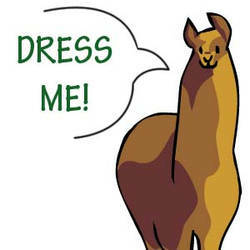 Please keep in mind that there are many, many deviants that want to reach the Golden and Run-away Llama. Please be patient as we work through all those that need to be featured. Just keep giving those llamas and I'll get you on the lineup soon. Please don't advertise for llamas on the blog comments...that's what the main page's comment section is for. As such, advertisements for llamas on this blog's comments will be hidden. If you feature this group by placing our icon in your journal, you will automatically get on the next list, but you must include that in your comment and it must be almost immediately visible on your profile page. Llama for llama. 102,235 given; 20,249 received. friends, it's my dream to get my twin llama badge within the next 12 months, as that will be around the time of my 10th year anniversary of being a member on DeviantArt. Planning to do a some giveaways, and some really cool raffles by January of 2020.. If you can take some time to help me reach my goal, I would very much appreciate it!